Burmese Cat breed information and advice. Burmese cat breed information and advice. The Burmese cat is like a little ray of sunshine with his sleek glossy coat and sunny personality. Imagine having an ever-present, highly intelligent sidekick with a mischievous streak glued to your side - that's what it's like to be owned by a Burmese! 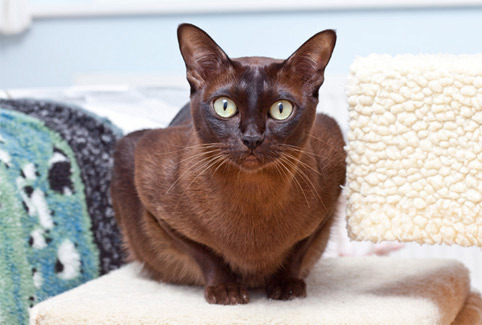 Juanita Sharp of the Burmese Cat Club fell in love with the breed when she was just 17 years old: "I became captivated by a friend's pair of Burmese boys. The little blue lad would jump on my shoulders and purr for England - I was hooked by their sleek appearance and their intelligent, lively, cheeky and ridiculously affectionate characters!" So why is the Burmese so special? "These characterful cats are alert, active, intelligent, ridiculously friendly and have an affectionate disposition with a 'glowering expression' and are just bursting with individual personality," Juanita explains. "Not only are Burmese cats such sleek and elegant creatures but they have incredible temperaments. They love to get involved with whatever is going on around the house - they are naturally curious and playful, and immense time wasters! These clever felines go for door handles, cupboard catches, light pulls, bin lids - they can operate them all! Mine even like to 'have a go' at operating the computers!" Emma Matthews of the Burmese Cat Society says: "Burmese are an extremely sociable breed who love human company and insist on being involved in every aspect of your life. They love to play and their favourite game is often to play fetch." Is your sidekick likely to get himself into trouble sometimes? "Occasionally they 'borrow' items from the neighbours - socks, golf balls and small items of clothing carelessly left on a washing line," laughs Emma. "There is no better introduction to your new neighbours than returning their missing underwear while trying to explain that your cat stole them!" Apart from keeping tabs on your nosy kleptomaniac, both Emma and Juanita agree that Burmese will fill your life with unconditional love: "They seem to crave human contact; loving nothing better than draping themselves around your shoulders, but they also know when you need them to comfort you, make you laugh or just to annoy that unwanted visitor that doesn't like cats," Emma says. They are extremely good with children and seem to understand that patience is required even when they are being dressed up and put in a pram or carried around by a toddler." "Once you are a Burmese owner, you will wonder how you ever managed without one," Juanita adds. The name 'Burmese' originates from the country of Burma where Wong Mau, who is considered to be the mother of the breed, came from. According to folklore, Burmese ancestors were kept as sacred animals in the temples and monasteries of Burma. They even had personal servants! Burmese were discovered in England in the late 1800s, but they were not as popular as the favoured blue-eyed Siamese and the breed gradually died out in England and Europe. It was revived in 1930 using the first true Burmese and it is said that a wartime sea voyage of three Burmese cats from Burma into America in the 1940s lasted five months, during which time they survived attacks by bombers. The breed was eventually recognized by the GCCF in 1952. Burmese are strong, elegant cats of a foreign type with sleek, glossy coats. They are quite heavy, muscular cats with slender legs, neat, oval paws and a straight tail of medium thickness, which tapers to a rounded tip. The head forms a short wedge with a slightly rounded top and the ears are rounded at the tip. The eyes are large, lustrous and golden yellow in colour, without any trace of green. Burmese are available in brown, blue, chocolate, lilac, red, cream and brown, blue, chocolate and lilac tortie. Cuddly, confident and sociable - that's the Burmese! It's not just their glossy coat that has the wow factor, their personalities are just as impressive. If you're looking for an outgoing, lively cat who wants to be part of your family then the Burmese is for you. Burmese cats love the company of people and other cats and are said to stay close to home. If you enjoy the quiet life, the athletic, fun-loving and mischievous Burmese probably isn't for you! Expect to pay between £450 and £650 for a pet quality kitten,with prices varying from region to region. No particular colour is easier to find than others and if you are prepared to travel you shouldn't have to wait too long for a kitten. As Burmese need plenty of stimulation you may like to consider buying two kittens for company - unless you have another cat or friendly dog in the house. Healthy Burmese kittens should be full of life and alert, with sleek coats, firm bodies, bright eyes and clean ears. Emma says: "Ensure the parents of your kitten and your kitten is registered with a governing body. You should be provided with a signed pedigree showing the registration numbers of the kitten's ancestors and the registration documents for your kitten. There are an increasing number of kittens advertised on the internet as Burmese kittens in non-Burmese colours, for example white or black." Juanita says: "Burmese breeders are passionate about their breed and have many more enquiries than they ever have kittens available! If you are invited to see a litter with a view to purchasing you will probably attend an 'interview' and you will need to show that you have carefully considered the breed and suitably caring in order to be 'selected!'" A Burmese's coat can be a good indicator of their health and the quality of their diet. They love to be groomed with a soft brush or a grooming glove. Juanita says: "Grooming is generally relatively low maintenance; I find a plastic flea comb removes loose hairs and encourages the coat to lie flat against the body without static build-up. "I also advise a good diet and the use of enzymatic toothpaste. Breeders also now have the 'tools' to test their cats for genetic markers associated with inherited diseases such as hypokalemia (muscle weakness associated with low blood potassium) and GM2 (are rare metabolic disorder)." Burmese can be prone to developing gingivitis so Emma recommends establishing a good dental routine from an early age: "Burmese can be quite greedy and care should be taken not to overfeed them," she adds.